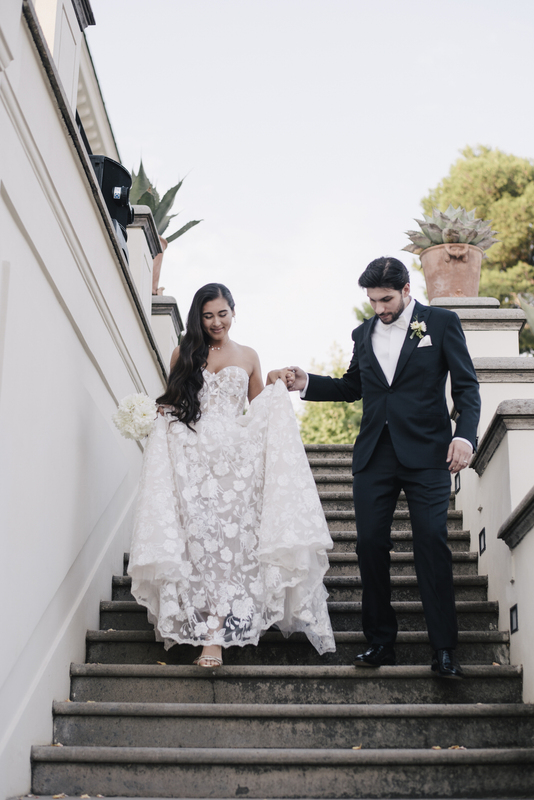 Asalya and Alex have been together since he age of sixteen and chose to crown their magical dream of love with an amazing destination wedding in Rome. 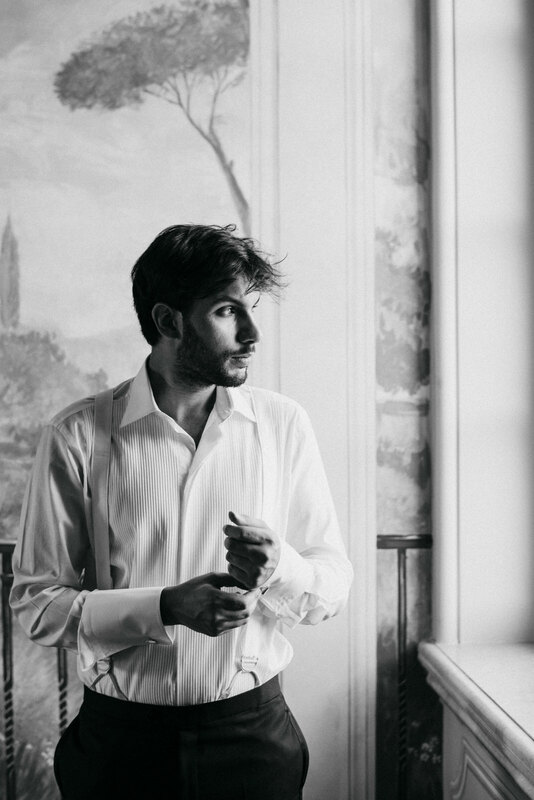 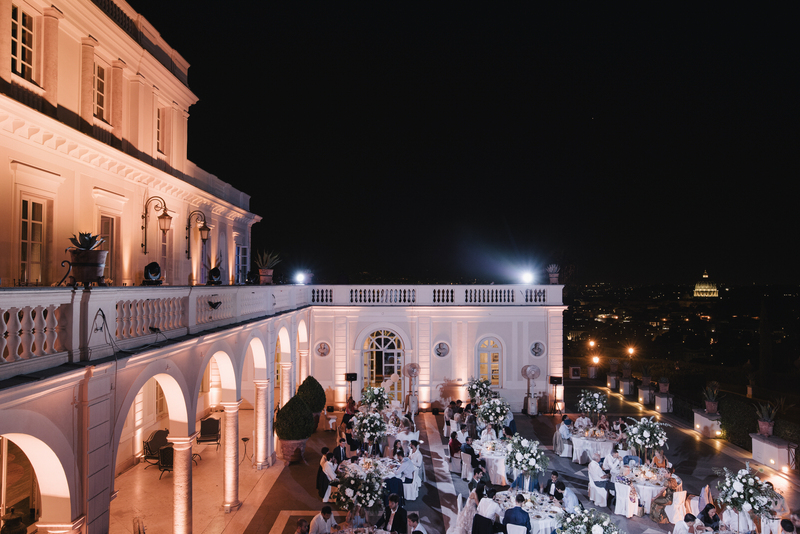 Surrounded by the joy and affection of friends and family, Asalya and Alex chose for the event the elegant neo-classical building that stands on the Monte Mario Hill, Villa Miani. 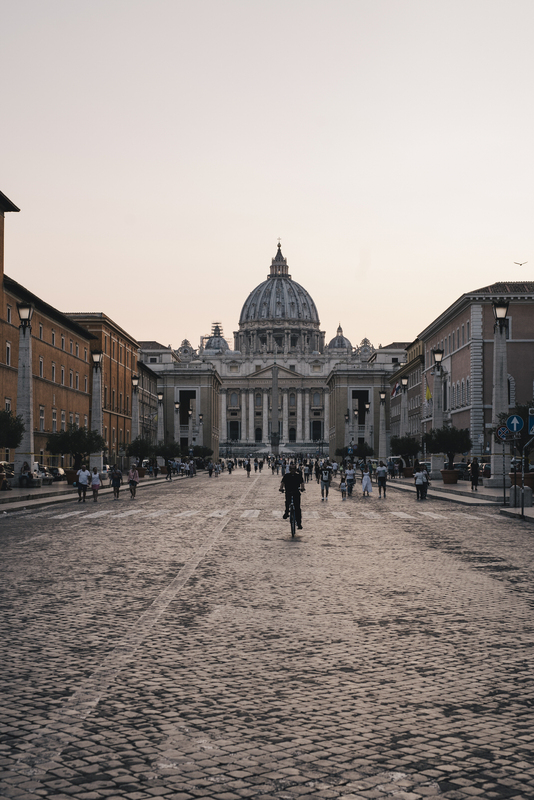 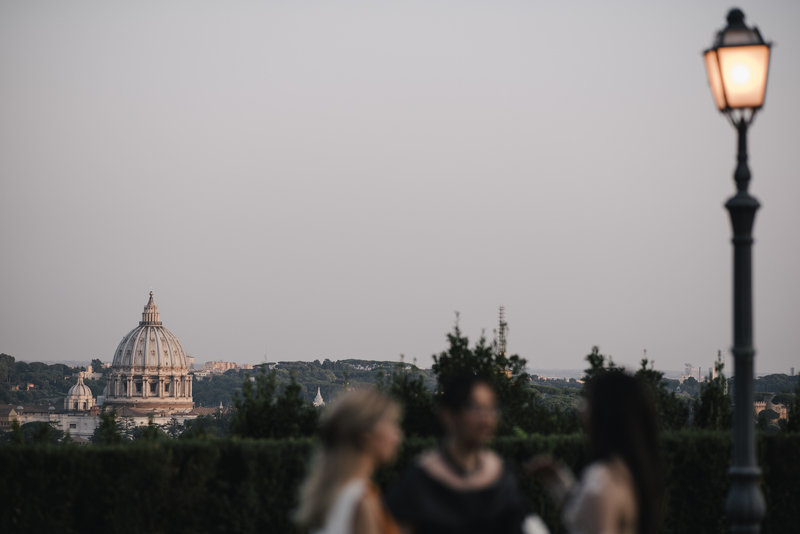 Rome is a city that needs no introduction. 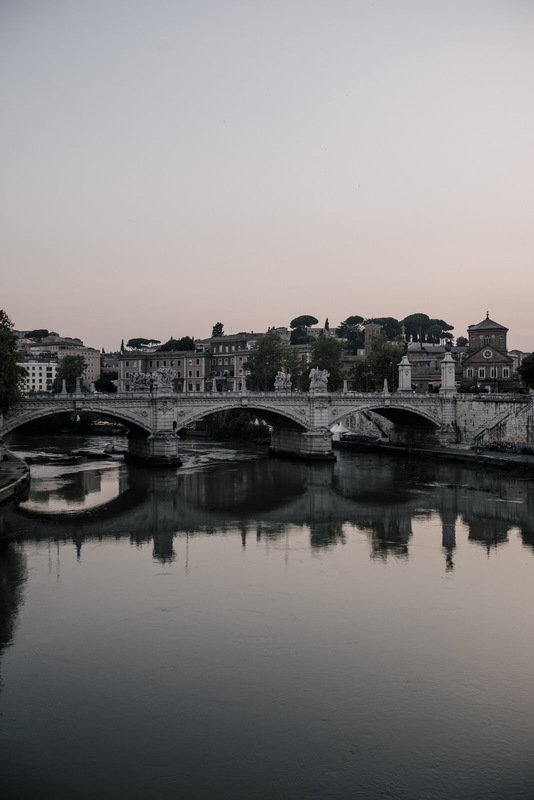 The past and the present come together, making it a place full of contradictions where it is difficult not to fall in love with the city.The bridges, the Lungotevere, the districts of the historic centre never tire the visitor. 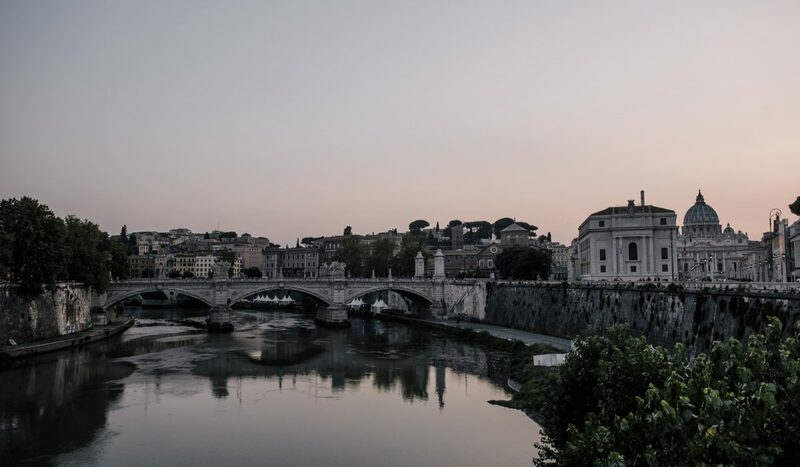 Its architectural richness, the places that have become famous through cinema and music, all envelop this city with a magical light. 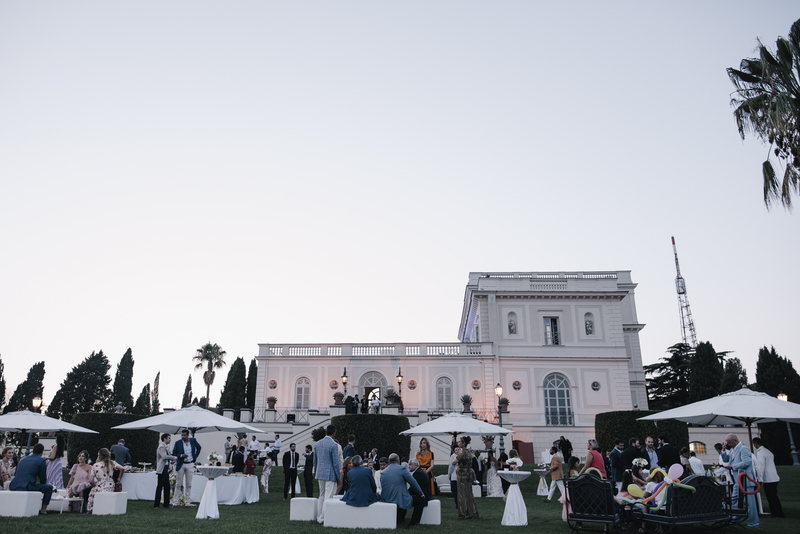 Naturally, the capital is home to countless villas for stylish events. 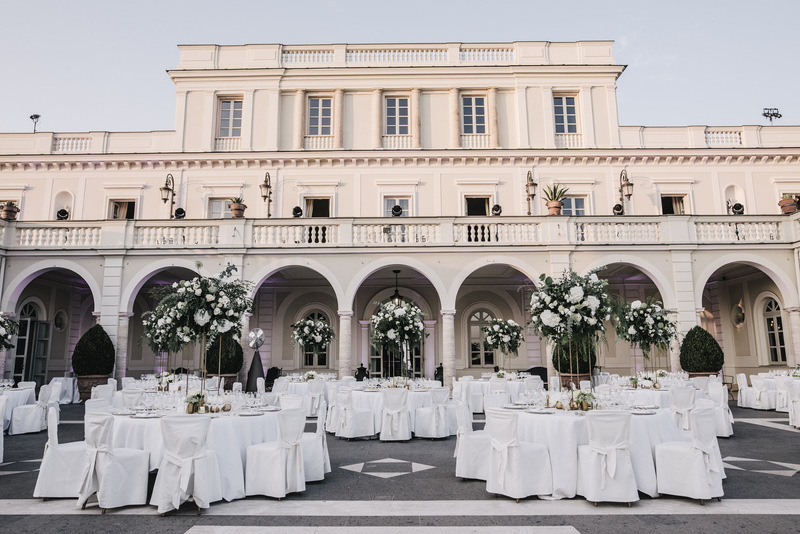 Among them, Asalya and Alex chose the exclusive Villa Miani. 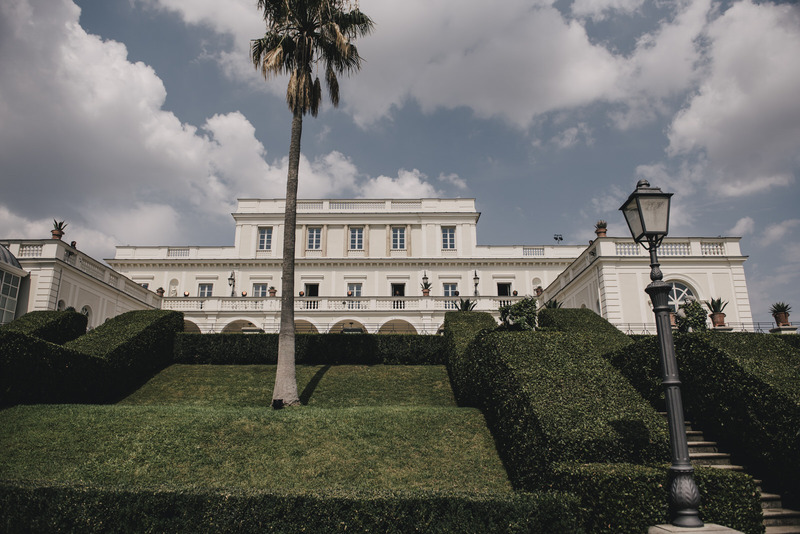 Villa Miani is a magnificent Umbertine residence, dating back to 1837 when it was built by the Monte Mario Company for the Counts of Miani. 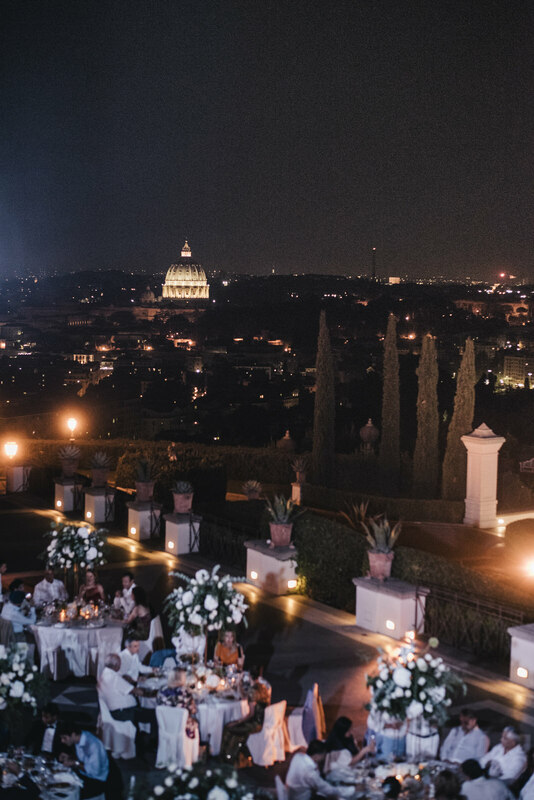 Surrounded by a vast garden and incredible terraces, it offers a spectacular panoramic view of Rome, with the Dome of St. Peters standing out in the distance. 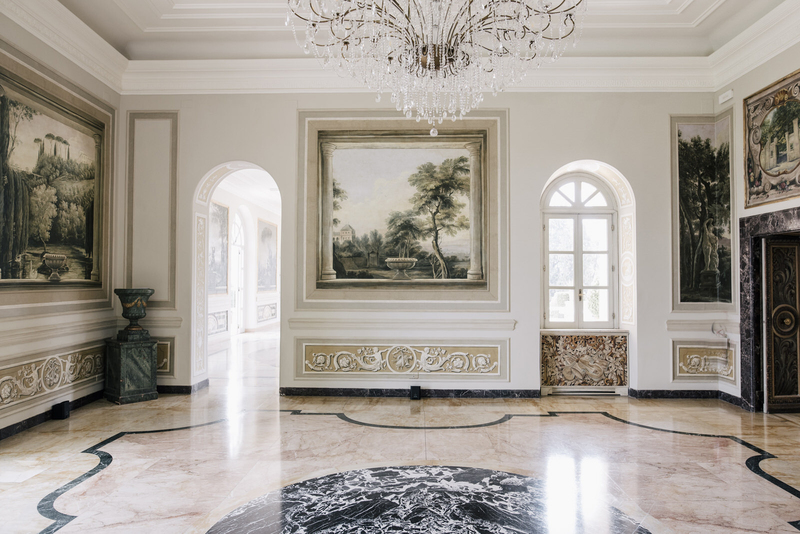 The elegant Villa Bianca boasts 2000 square meters of internal halls, with frescoes and decorations of incredible refinement. 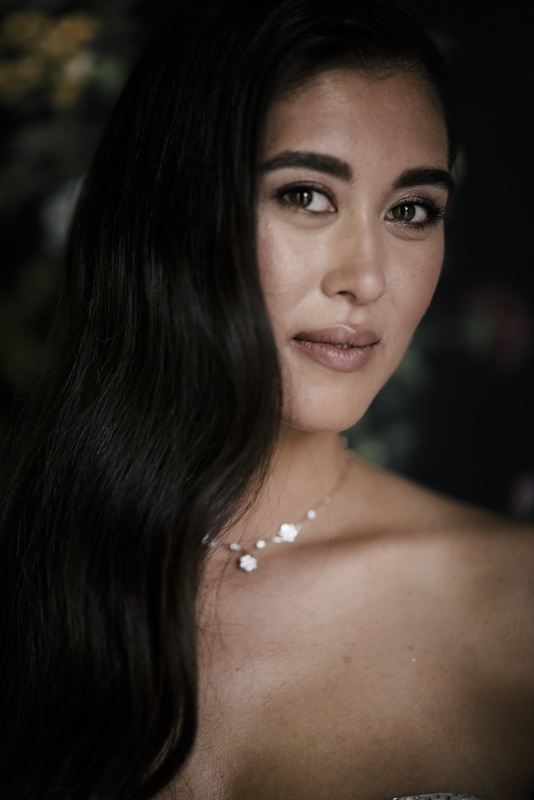 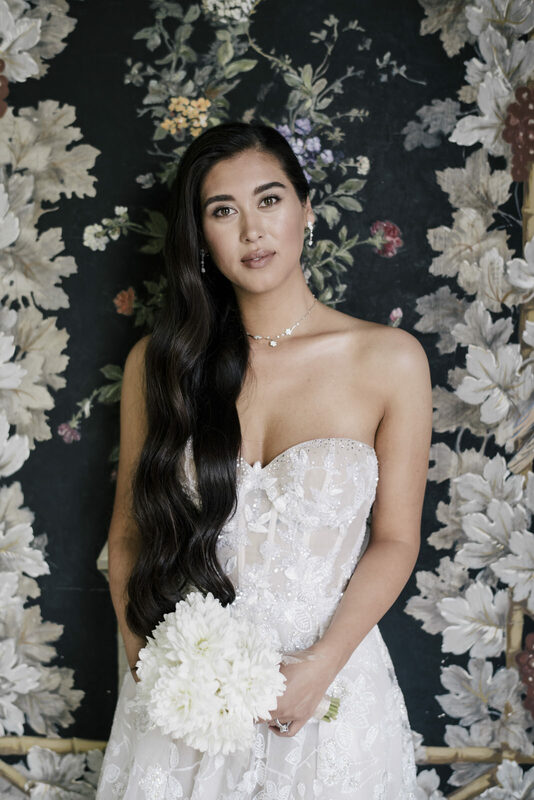 With long, dark and wavy hair and a dark complexion, Asalya is a beautiful bride. 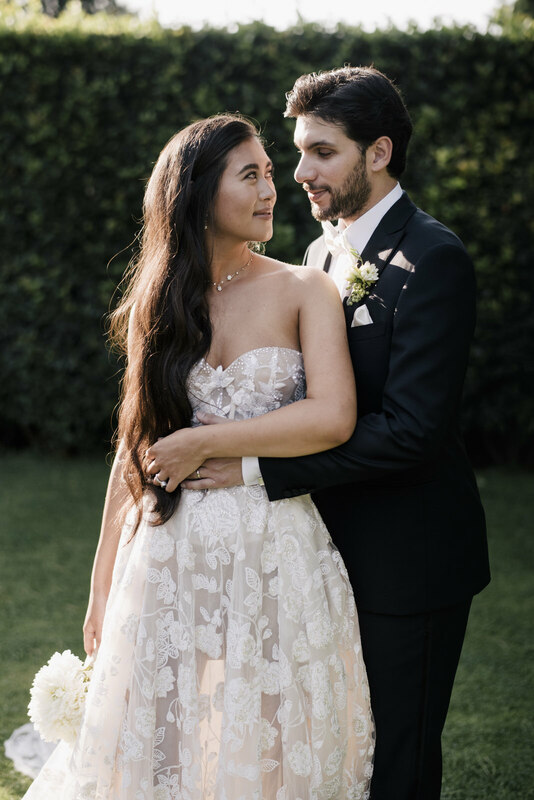 For this wonderful day, she chose the GEORGIA dress, taken from the “Victorian Affinity” collection by Galia Lahav. 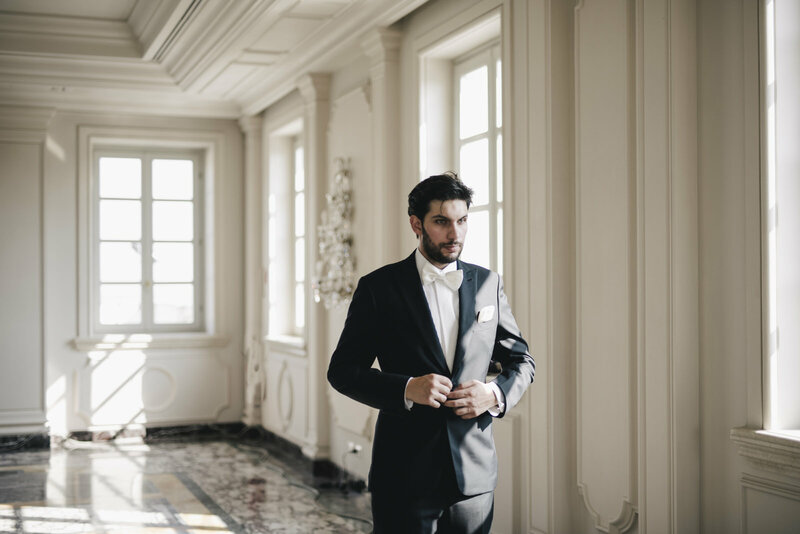 “Victorian Affinity” is inspired by the Victorian era in England and its parallel phase in France known as “Le Belle Epoque”, when an atmosphere of great optimism reigned. 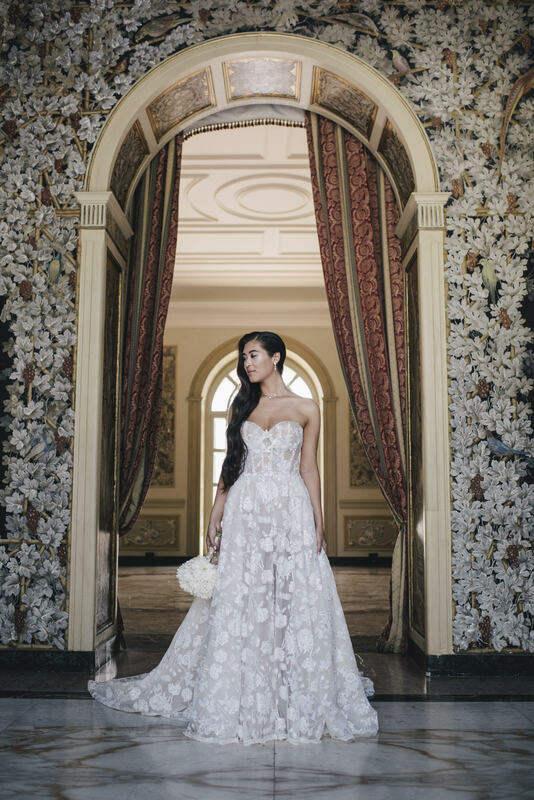 The wedding dress had to be treated with love and care, precisely because it is worn by the bride on the most special day of her life and must be designed with the contours of the female body in mind. 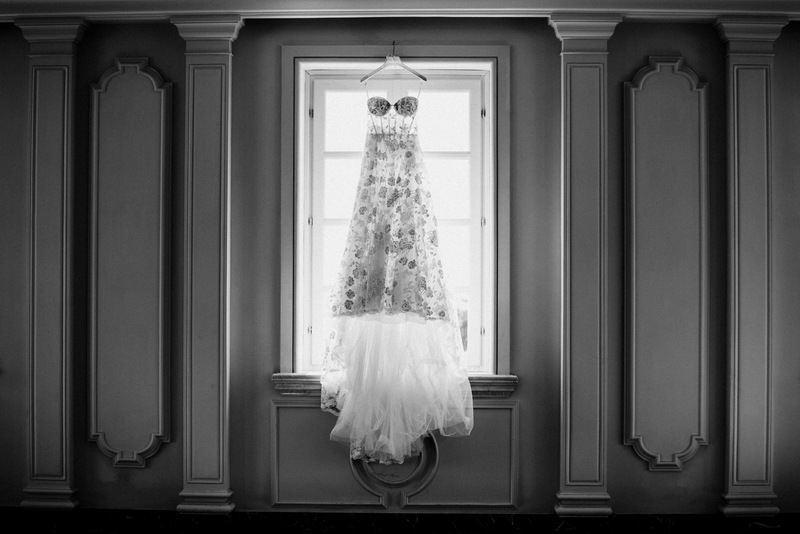 The Victoriana period was the inspiration for the dress. 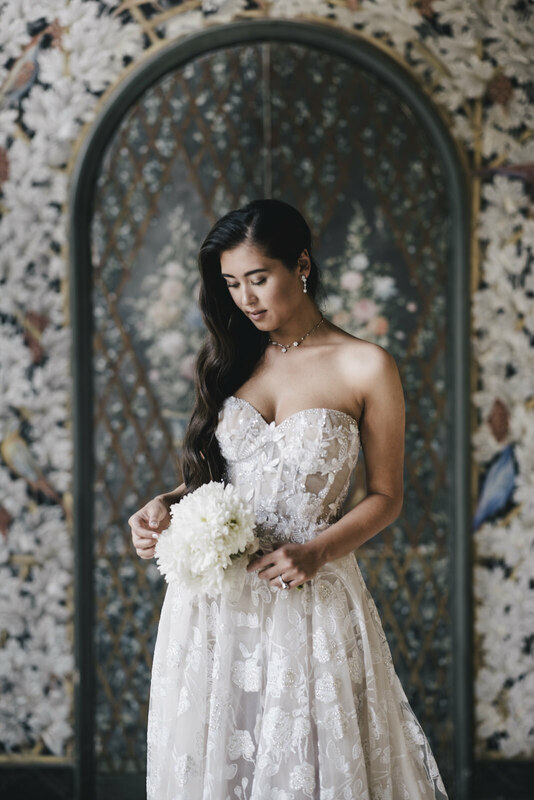 The dress chosen by Asalya is the “Georgia”, made with a corset top embroidered with three-dimensional flowers and an ivory skirt – the shades chosen for the entire event – with a Victorian rose pattern made of pearls and sequins. 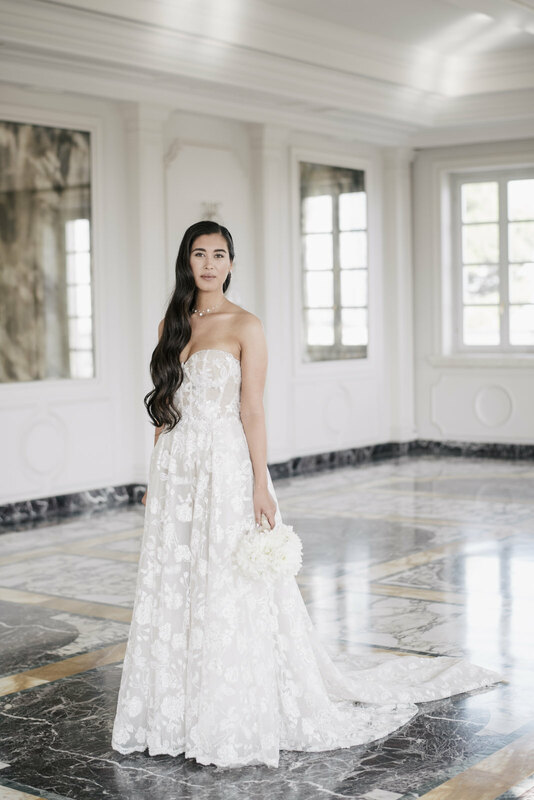 To complete the incredibly romantic look, her long hair was loose in seductive waves with a natural and luminous make-up, created by the expert hands of Lara Navarini. 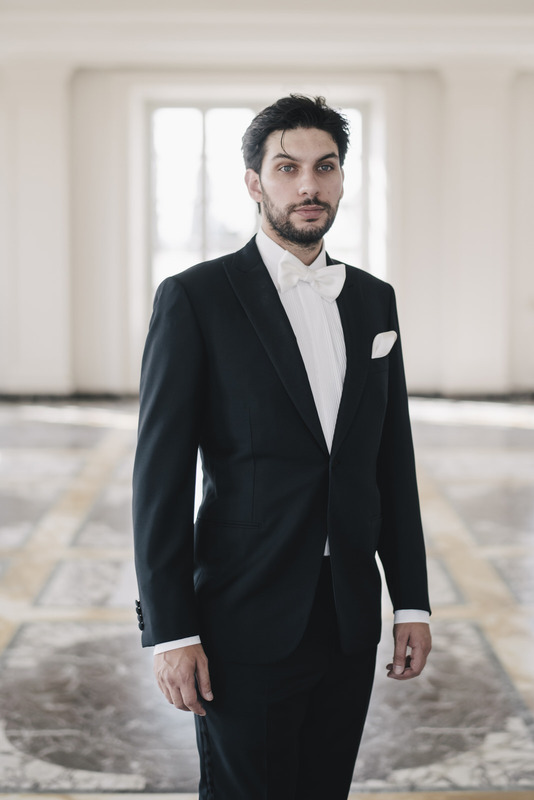 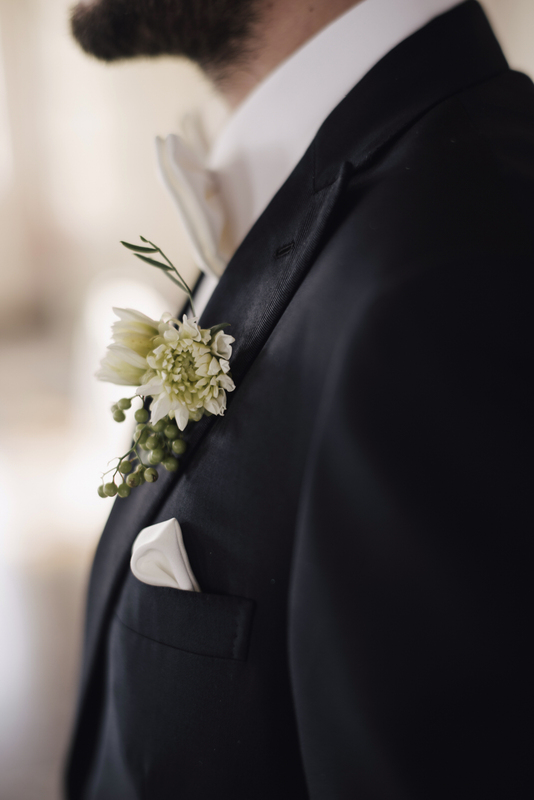 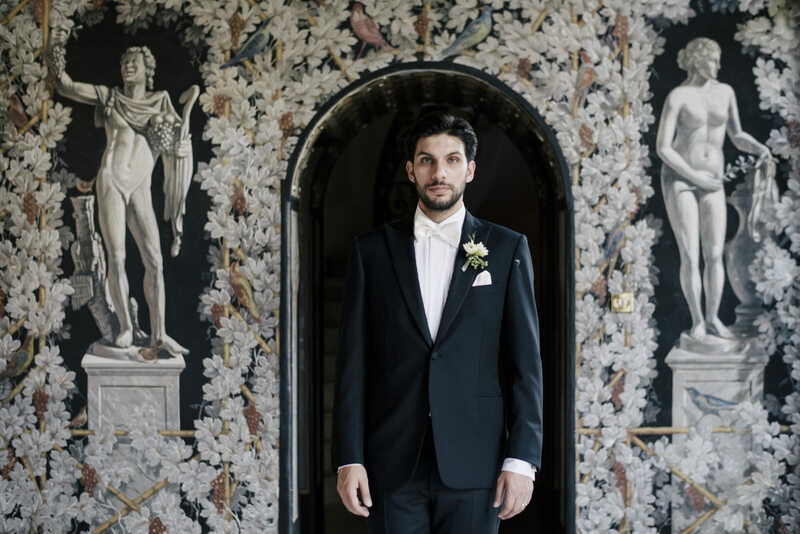 For Alex, an elegant black suit with shirt and white cream bow tie and boutonniere, in harmony with the colours and the look of Asalya. 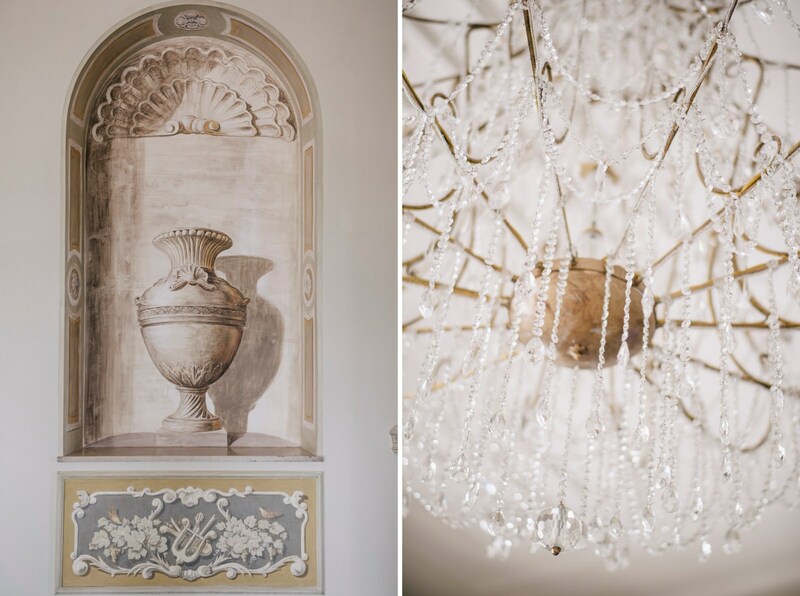 The rooms of Villa Miani stand out with three dominant shades of cream, gold and green. 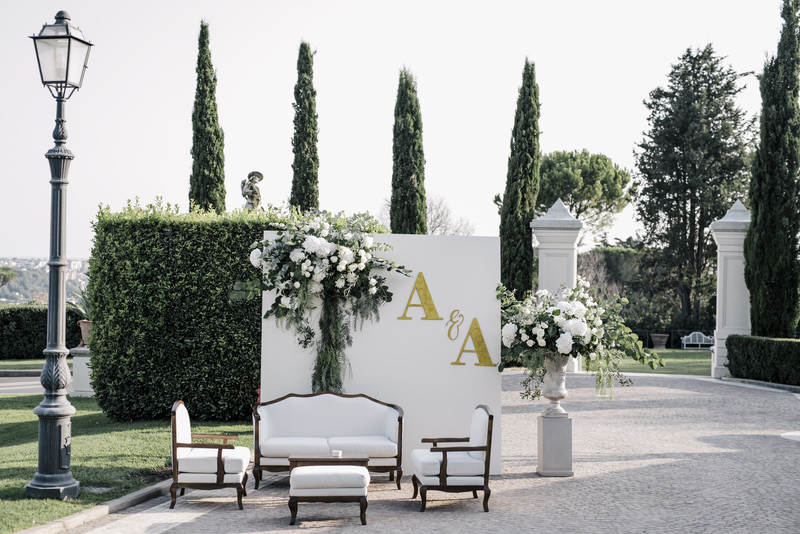 Led by the experienced team of Exclusive Italy Weddings, Asalya and Alex wanted to keep the same colours for the whole event: the bride’s bouquet made of white flowers, the high floral arrangements that embellished the tables in gold, white and green, and, finally, the cake also made with four alternating layers of cream and gold. 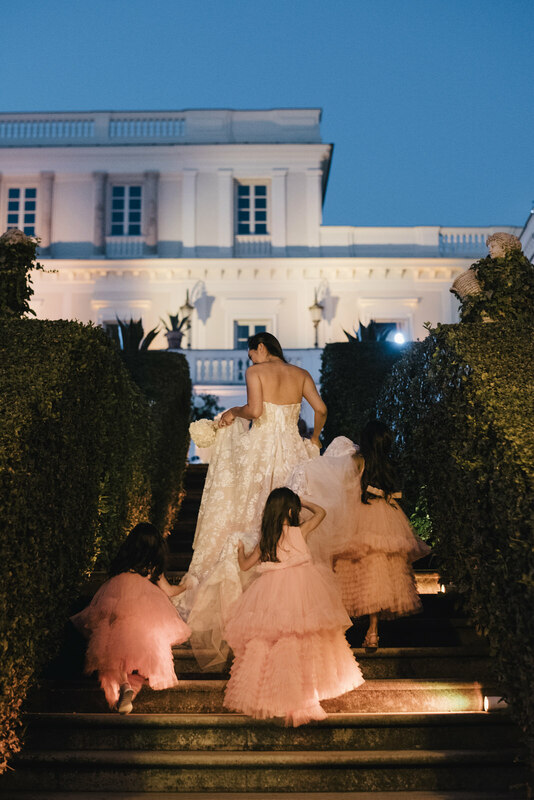 Rather than celebrate the wedding, Asalya and Alex wanted to create an incredible party involving a large group of friends and family from all over the world. 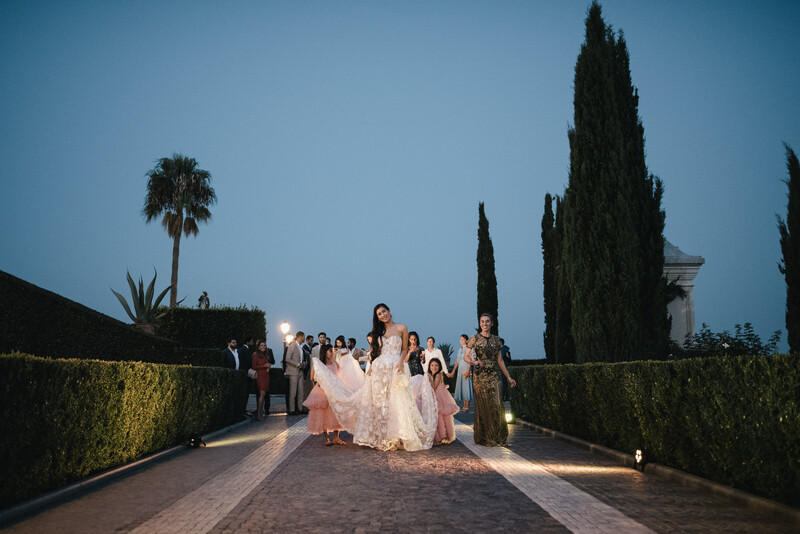 They excluded the formal ceremony to focus exclusively on being together with their guests to enjoy the beauty of the location and the landscape. 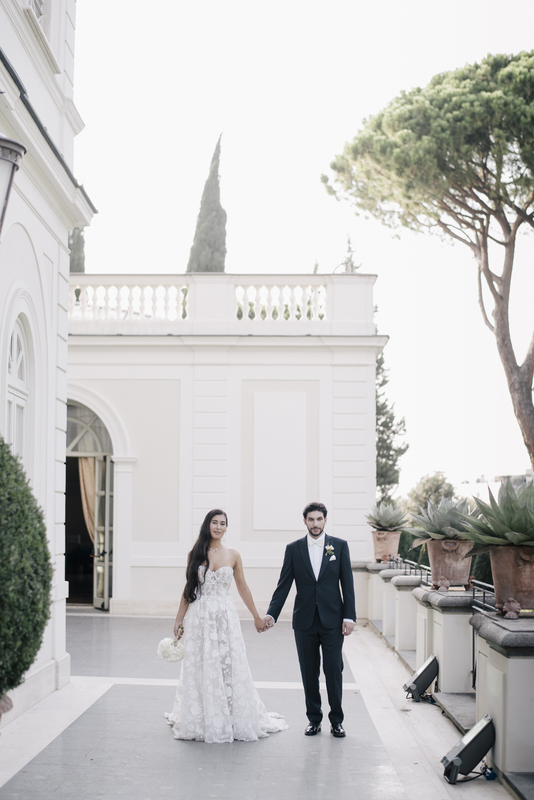 After the preparation in a large hall of the Villa, we took advantage of the charming English gardens surrounding the villa, as well as the interior for a brief but intense photo session with Asalya and Alex. 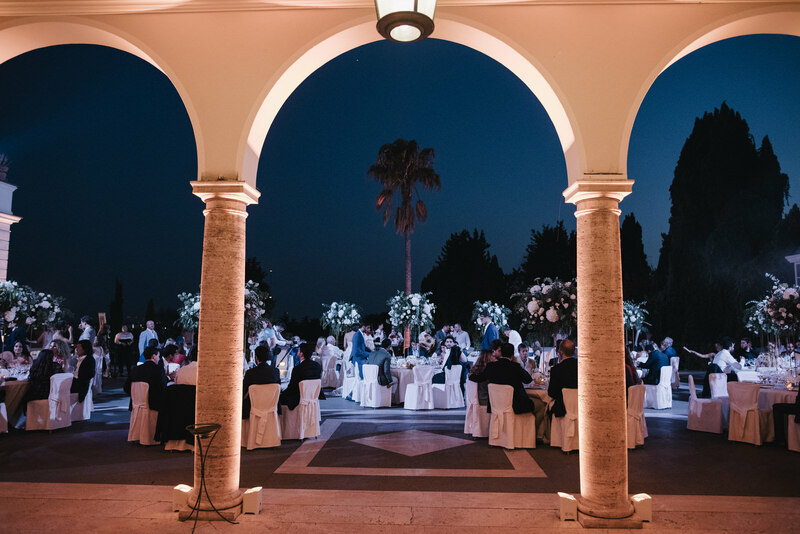 Then the young couple joined the rest of the guests for a pleasant refreshment until sundown, when the golden light of the sunset enveloped the incredible panorama in an aura of magic. 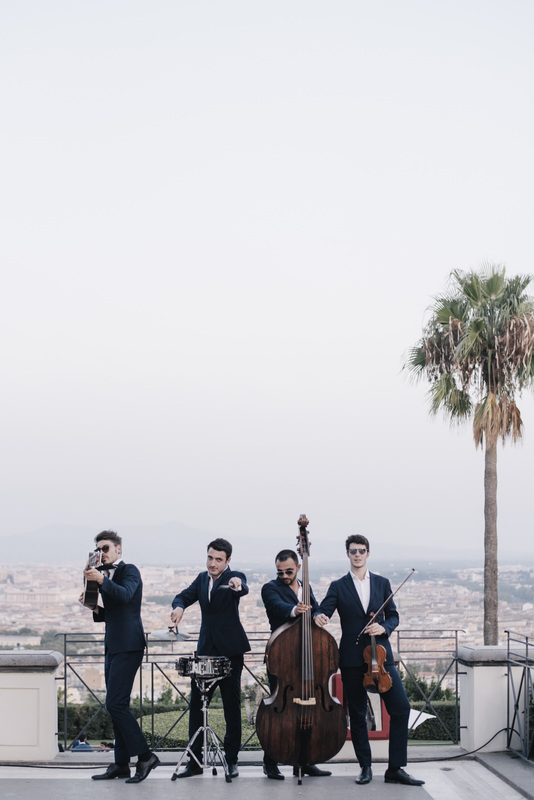 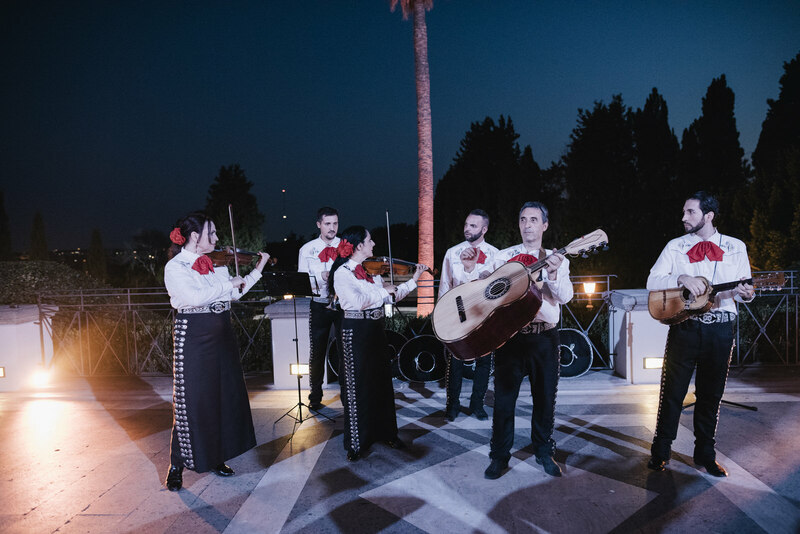 To the lively sounds of the musical group Mariachi, an icon of traditional Mexican music, Asalya and Alex invited all the guests to take a seat on the large terrace of Villa Miani for a delicious outdoor dinner. 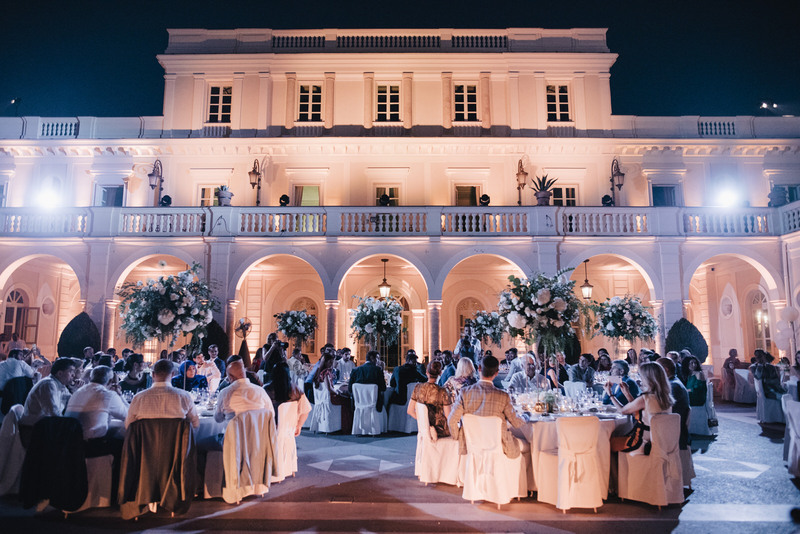 After dinner, we all gathered in the large internal hall for cutting the cake and for the first dance of Asalkya and Alex. 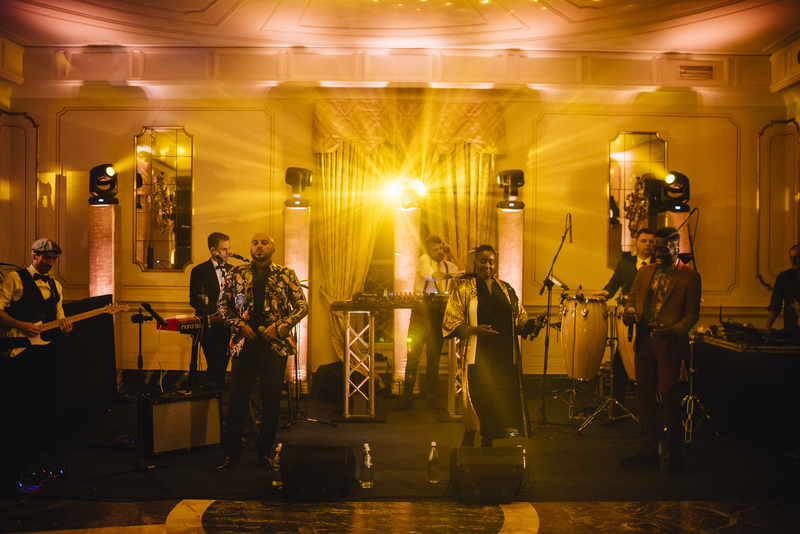 On a stage set up for the occasion, the Sensation Band, a London group were able to draw everyone into an incredible dance party! 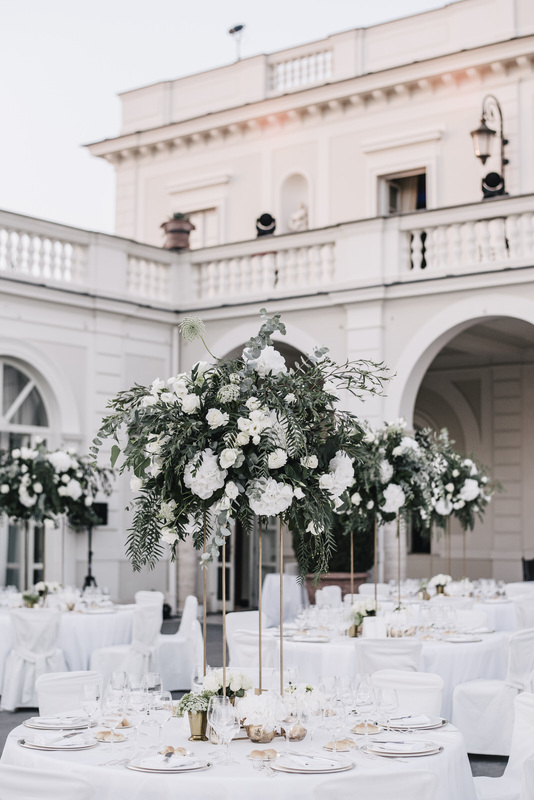 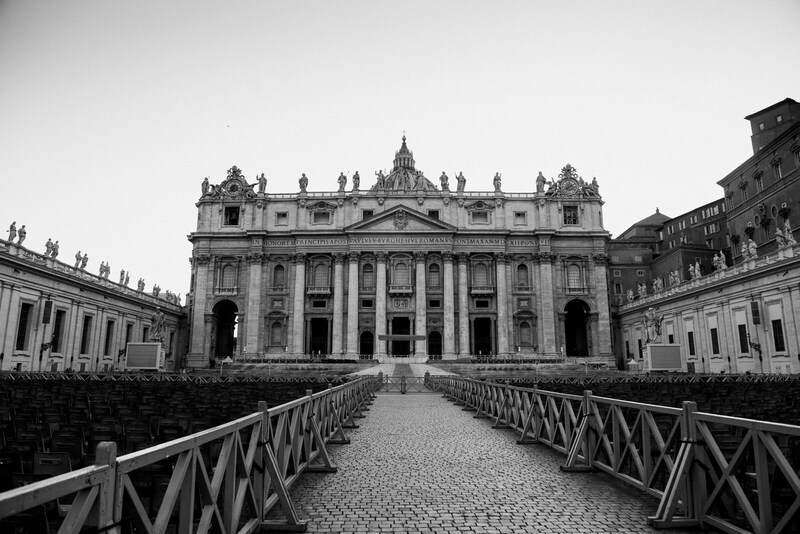 Are you planning your destination wedding in Rome? 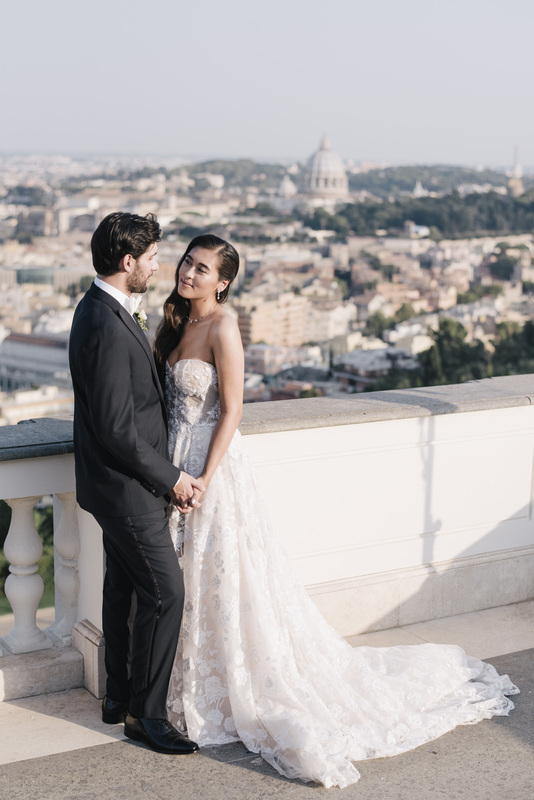 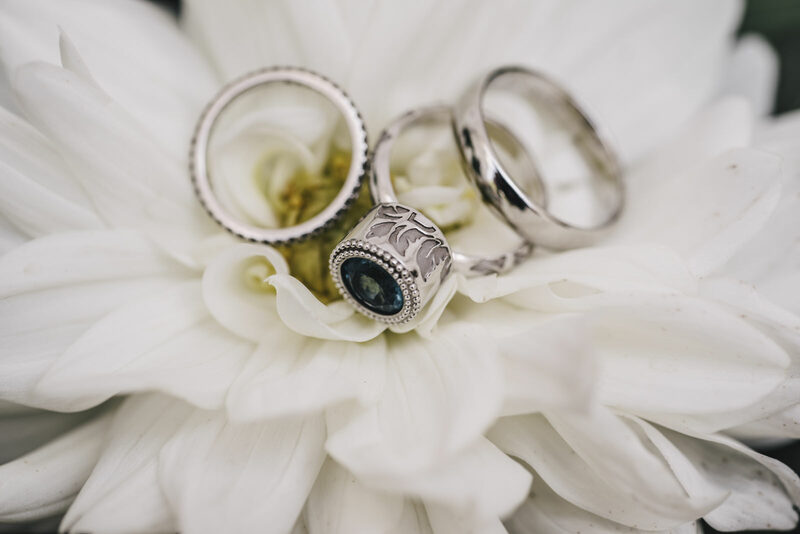 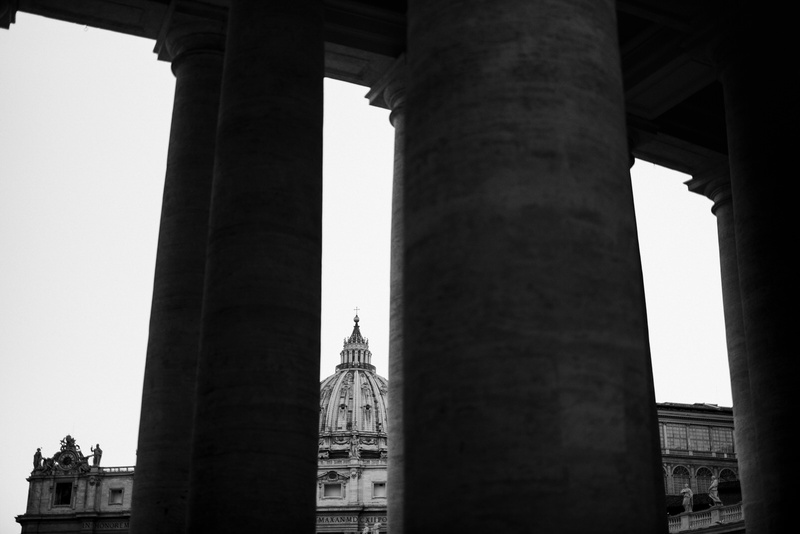 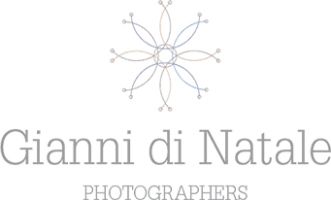 Have a look at our blog post “Rome Wedding Photographer, Sarah & Max” and get in touch now… We would be so happy to tell your story!